Spring has finally arrived and there are so many fun and exciting trends for this season. There is the Midi, the Maxi, the White trend, the Little Black Dress, Black/White, Bold Colors, Lace, and the Floral and Graphic print trend. This Harlowe and Graham Pleated A-Line Midi Skirt above, is totally on trend for Spring. It's has an ultraslim high waist line, and it's a perfect length for work or play. You can never go wrong with a comfy maxi length dress, paired with the perfect flat sandals. All white, or shades of white, was a big hit on the the runways for this Spring. The contrasting black and white combo packs a serious statement for the season. 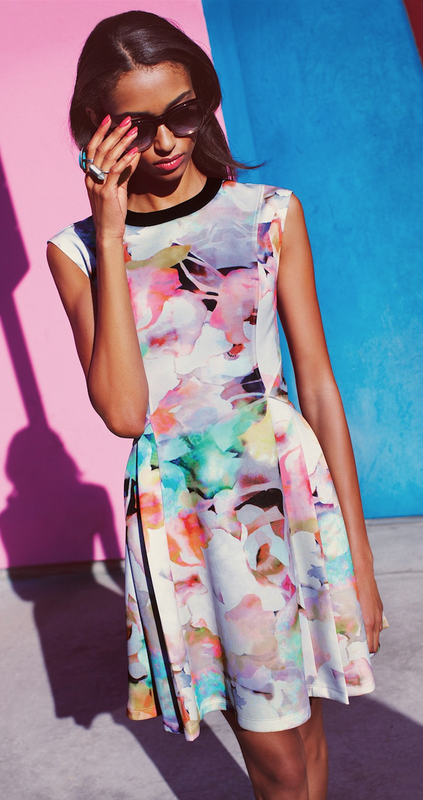 Pattern play with graphics, or feminine florals are a perfect addition to your Spring wardrobe. Delicate lace is an exciting and popular trend for Spring creating a romantic and glamorous look. And of course, go for the bold bright gorgeous colors that are available...the beautiful blues, reds, and pinks!! It's finally Spring!